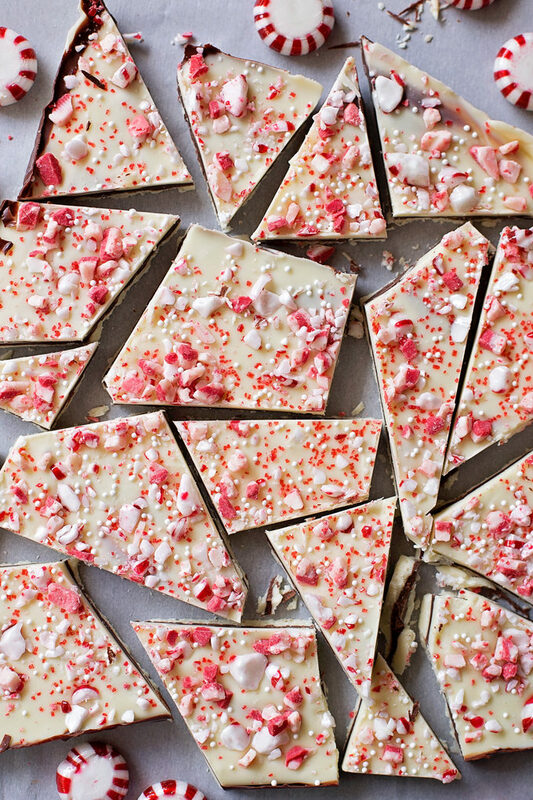 Don’t waste your money on a tin of store-bought candy when you can make your own homemade peppermint bark! It’s easy and so delicious! This past weekend I went to plug in my SD card to pull pictures for a this post and they were all gone. GONE. I was in shock. Everything I had saved up for December had suddenly disappeared. I hadn’t used the camera in days so I wasn’t like I accidentally wiped the card (which is hard to do without knowing). Thankfully my amazing husband came to the rescue and managed to recover everything. 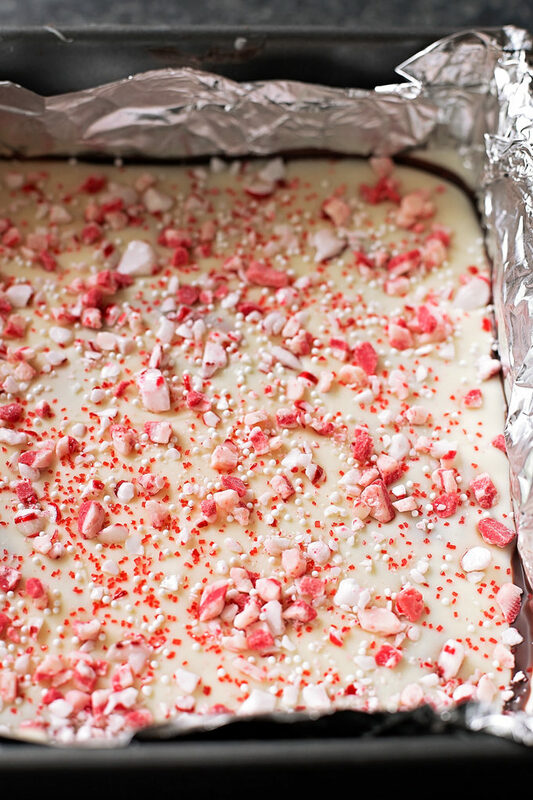 We’re still not sure what happened but what a relief it was to see all 4,000+ files, including the ones for this homemade peppermint bark! Whew. 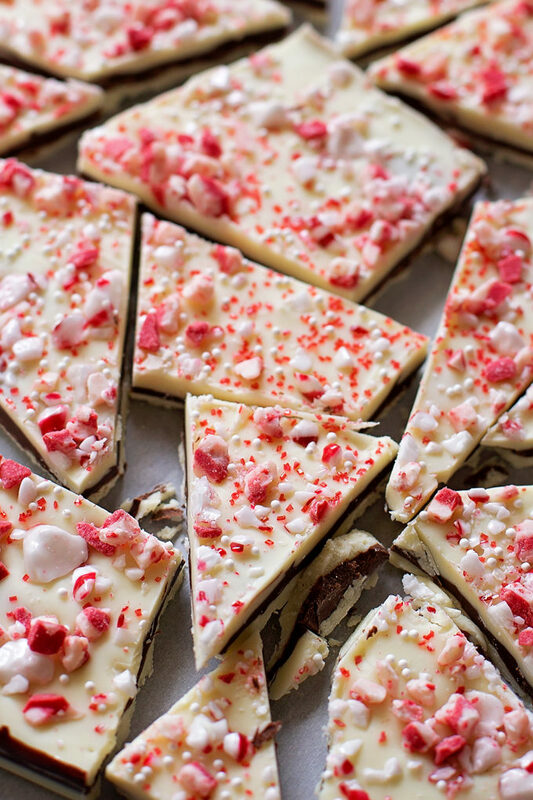 I look forward to sneaking a few pieces of peppermint bark from the candy platter every year. It’s one of those treats that never gets old. Buying an entire tin of it can be really expensive. Making it at home is definitely more practical and a lot more fun! This bark was easy and tasted just as good as the store-bought kind, if not better. My only words of advice for this recipe is be patient and use quality ingredients. Don’t burn the chocolate in the microwave (trust me, it’s easy to do). If you’re not comfortable with microwaving it, you can always use a double boiler and go the stovetop route instead. Make sure you wait until the chocolate is set enough to spread the next layer over top or you’ll end up with a marbled look instead of even layers. And finally, use high quality chocolate and extracts. When chocolate is the main ingredient, spend a little extra on it! 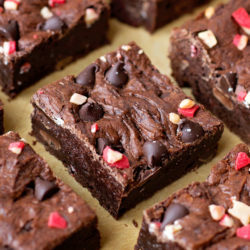 I prefer using Ghirardelli baking bars. 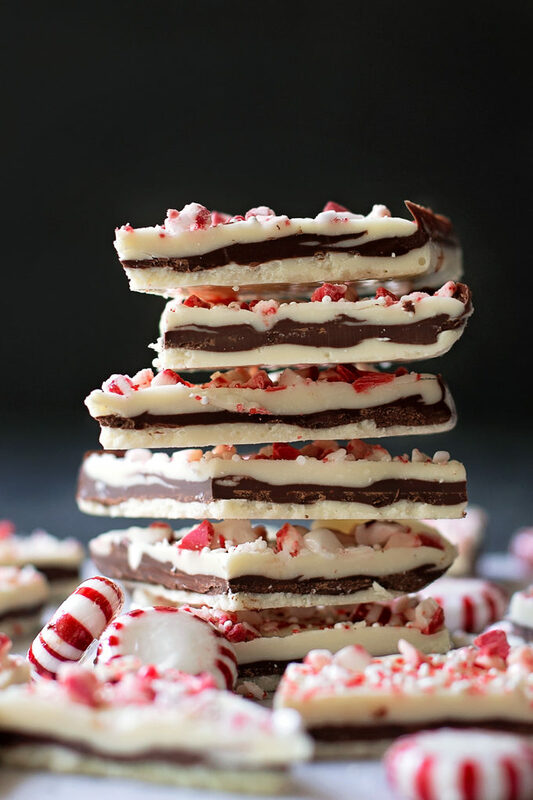 This festive homemade candy is perfect for holiday platters. Give it a try- you won’t be disappointed! 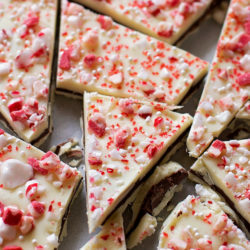 Don’t waste your money on a tin of store-bought peppermint bark when you can make this easy homemade version! Line an 8-inch or 9-inch square baking pan with parchment paper or foil, set aside. In a medium microwave-safe mixing bowl, melt 6 ounces of white chocolate with 1/2 teaspoon of oil. Melt for 15 seconds, stir, repeat until the chocolate is completely melted and smooth. Take care not to burn the chocolate. Stir in 1/2 teaspoon of peppermint extract and 1/4 teaspoon of vanilla extract. Pour the white chocolate into the prepared pan. Using an offset spatula, spread the chocolate to create a smooth, even layer. Place in the refrigerator for 15 minutes to firm up. Do not leave it any longer. Meanwhile, in a medium microwave-safe mixing bowl, melt 8 ounces of semisweet chocolate with 1/2 teaspoon of oil. Melt for 15 seconds, stir, repeat until the chocolate is completely melted and smooth. Take care not to burn the chocolate. Stir in 1/2 teaspoon of peppermint extract. Remove the pan from the refrigerator and pour the semisweet chocolate over the white chocolate. Carefully spread into a smooth, even layer. Place in the refrigerator for 15 minutes to firm up. Do not leave it any longer. In a medium microwave-safe mixing bowl, melt remaining 6 ounces of white chocolate with 1/2 teaspoon of oil. Melt for 15 seconds, stir, repeat until the chocolate is completely melted and smooth. Take care not to burn the chocolate. 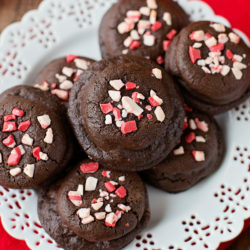 Stir in the remaining 1/2 teaspoon of peppermint extract and 1/4 teaspoon of vanilla extract. Pour the white chocolate over the semisweet chocolate. Using an offset spatula, spread the chocolate to create a smooth, even layer. 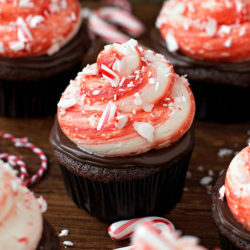 Top with crushed candy canes or peppermints (and sprinkles if desired). Place in the refrigerator and chill until fully set, about one hour. Break into pieces and store in the refrigerator. – Shortening can be used to help the give the chocolate a harder, more crisp texture. I make this every year but I have never seen a recipe where you add oil to the chocolate. Is there a reason? Hi Katie, it’s to help prevent it from seizing. Totally precautionary, but always a good idea if you’re using a microwave instead of a double boiler. If you want a firmer bark it helps as well (if you use shortening). Shortening makes it firmer? Another fact that I didn’t know. I’m assuming that you means something like the vegetable Crisco. How long will this keep in the fridge? And can it be frozen? It looks so good!! Can I use good quality white chocolate chips and chocolate chips in this recipe? Thanks.